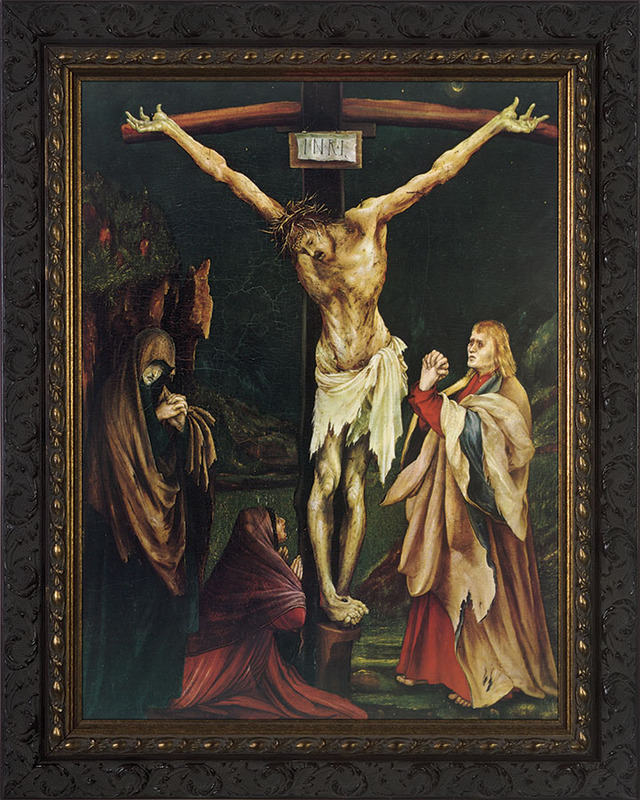 This haunting and powerful depiction of the Crucifixion by Grunewald is beautifully complemented by an antique dark ornate frame under non-glare glass. A truly artistic and religious addition to any home! Grünewald's work is characterized by mystical power and a highly personal use of radiant colors and distorted forms. Here Jesus' body festers in a gruesome depiction of suffering. The Virgin Mary weeps; Mary Magdalene falls to the earth; and the grief-stricken John the Evangelist bends his wrists at a painful angle. The unusual light effect intensifies the emotional impact and illustrates the biblical account of Christ's death: "and there was a darkness over all the earth." In fact, a solar eclipse occurred over Germany on October 1, 1502, and the artist, with a Renaissance interest in natural phenomena, may have recorded it in the shrouded sun seen at the upper right. In his famous Isenheim Altarpiece, commissioned by a German monastery, Grünewald used a variant of this expressive composition. 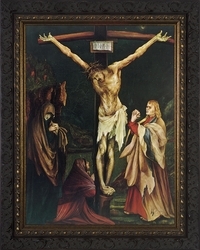 The only Grünewald painting in America, The Small Crucifixion bears a traditional title, first given to it in the seventeenth century to distinguish this private devotional work from the monumental altarpiece. 4 Options Available - see drop down box for pricing.